On 7th March, Alan attended a Recoil release party at the Lalic Club in Köln, Germany. Organised by Intercord's Anne Berning and Simone Wien in conjunction with the club owner, the event was very well received and a good time had by all. 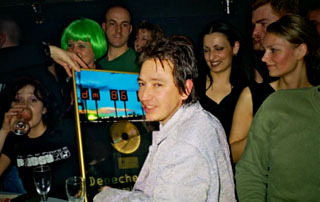 As well as signing various Recoil CD's and promotional items, Alan was pleased to accept a gold disc to commemorate sales of Depeche Mode's 'The Singles 86 - 98'. Photograph courtesy of Elvis Rashidi. The album, video and EPK were featured as well as competitions to win copies of the LP.